Adams County, WI is located between Wisconsin Rapids and The Dells one of the hottest tourist spots in the entire midwest. Adams is more of a countryside farming & recreational area with a couple larger communities including; Adams, Grandmarsh, Arkdale, Dellwood, Friendship, Rome and Oxford. Enjoy some of the outdoor life on public land including; Colburn Wildlife Area, Upper Neenah Creek Fishery, Leola Marsh Wildlife Area and Big Roche-A-Cri Fishery Area to name a few... Adams County, WI is located in the Center of the State north of Madison the Capital about 60 miles and is surrounded by 7 other Counties; Wood, Portage, Waushara, Marquette, Columbia, Sauk and Juneau. On this page you will find Campable Properties, Camping Property, Campsites for Sale, RV Recreational Vehicles, Campers on Land for Sale, Popup Campers, Park Models, Campgrounds, Truck Camper, Real Estate for Camping and more located in the county listed by real estate agents. 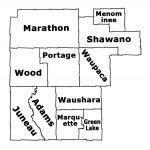 More information on Central Wisconsin. Resorts / Campgrounds for Sale in Adams Cty, WI.